Giving a child a time-out can be a useful tool to help them cool down and learn good behavior. Here are some tips from the American Academy of Pediatrics. 1. Warn your child first, "If you don't stop, you'll have a time-out." 2. Name the behavior (i.e., "don't hit"). 3. Have your child go to a quiet place, like a corner of a room, not the bedroom or a play room. 5. If your child leaves the time out area, have her go back. If she throws a tantrum during time-out, ignore it unless there is danger of harm. 6. Restart the timer. Explain that he needs to "stay put" until it's over. Should I skip the timer? With children who are at least 3 years old, parents can try letting their children lead their own time-out. You can just say, "Go to time out and come back when you feel ready and in control." This can take the place of the timer and help the child learn and practice self-management skills. This strategy also works well for older children and teens. Adults can take time-outs, too. 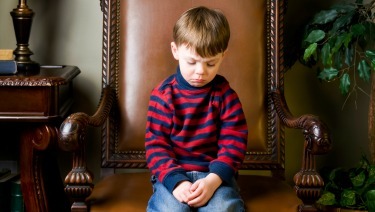 Correcting a child's behavior can be hard and, sometimes, frustrating. If you start to feel stressed or out of control, you can take a time-out for yourself. First make sure your child is in a safe place, like a playpen, crib, or bedroom. Then, do something you find relaxing, like listening to music, reading or meditation. When you feel calm, go hug your child and start fresh. Grandparents and other caregivers can learn how time-outs work, too. Like with all discipline tools, the key is trying to use time-outs the same way each time for the behavior you want to stop. But, remember, time-outs can be used too much. Try other positive ways to correct your child's behavior. Talk with your pediatrician for more ideas. What's the Best Way to Discipline My Child?